CarteNav Solutions is getting ready for a busy summer tradeshow season, kicking off with two shows at the same time - CANSEC and PAvCon towards the end of May. The Halifax-based software company will be showcasing the latest features of its cutting-edge intelligence, surveillance, and reconnaissance (ISR) software solutions to the National defence and aerospace community at Canada’s premier defence tradeshow on May 27-28 at the EY Centre, Ottawa. At almost the same time, on 26-27 May, CarteNav will also be demonstrating the suitability of its software to police aviation specialists at PAvCon in the Netherlands. “The progress made by CarteNav over the last year has been really impressive” said Paul Evans, CarteNav’s CEO. “Winning the NPAS rotary-wing bid was a real highlight, and this ably demonstrates the suitability of our software for a wide range of applications” he continued. CarteNav’s AIMS-ISR® and AIMS-HD software solutions are in use the world over, not only on aircraft, but also on ships and reconnaissance vehicles, giving the company a presence in over 17 countries across the globe. 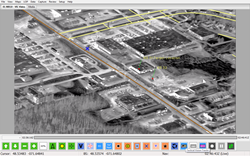 Although originally developed through defence research projects, CarteNav’s software has seen huge commercial success, not only in airborne reconnaissance, but in other applications and mission types, such as Search and Rescue, fire mapping, infrastructure monitoring, and of course, airborne law enforcement, to name just a few. “The flexibility of the software means it can be adapted to many mission types” added Mr. Evans. “From a core base, AIMS has been developed using plug-in architecture, allowing quick and easy integration with a wide range of camera systems and other sensors. The customer can choose what they need to be integrated, and AIMS can provide all the information from the sensors in a single interface. This in turn creates huge efficiencies for the mission and the platform, no matter what the task” he concluded. Advanced mission management tools, in-video overlays, and in-video control means the operator has access to everything they need at the touch of a button. Coupled with a powerful map engine and the flexibility to be installed on most types of hardware, CarteNav has created a compelling solution for many mission types. CANSEC is Canada’s premier defence tradeshow and will be held on May 27-28 at the EY Centre, Ottawa. This two-day show is organized by Canadian Association of Defence and Security Industries (CADSI) and features more than 690 booths covering 120,000 square feet of exhibits, and will host over 30 international delegations. PAvCon is a market-specific show, focusing on law enforcement aviation. It includes specialist speakers and flight demonstrations. Participating this year are all the police services in central Europe and a number from industry. PAvCon 2015 will be held at the new Breda International Airport, Netherlands on the 26-27 May 2015. CarteNav Solutions Inc. is an international leader in mission and sensor management software solutions for the airborne, land, and maritime environments. Founded in 2002, CarteNav offers operationally proven technology that integrates, manages, and displays relevant data that dramatically improves performance of both sensor operators and tactical decision makers. The company has established a reputation for providing sought-after and high-value solutions that can be deployed on a wide variety of platforms for multiple mission types for government, military, and commercial customers.